Awards aren’t important. Or at least, they aren’t important enough to justify the cost. That’s the clear message sent by WAGA, which has stopped spending money on the Southeast Regional Emmy awards. Traditionally, TV stations select a limited number of entries worthy of submission and pay the entry fees, roughly $90 a pop. Individuals within those stations may choose to fork out their own cash to pay for entries they believe the station has overlooked. Do the math, and the costs add up quickly. Figure that for every nomination, two or three additional entries didn’t get nominated. 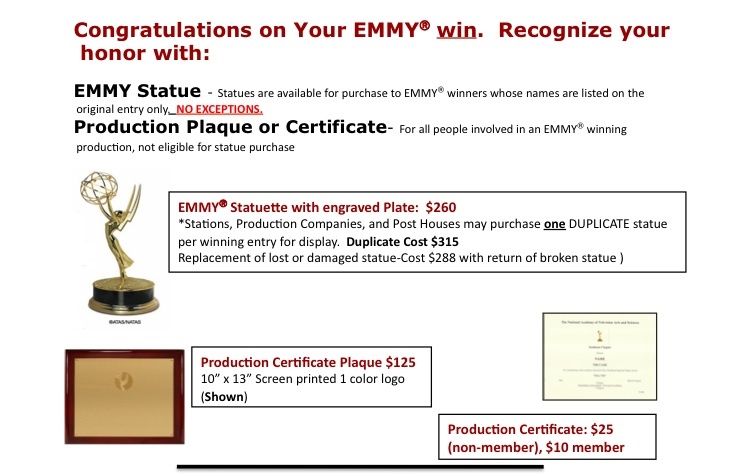 Add the expenses paid for Emmy statues (first one’s free, the rest have to be purchased. So when five names are on the winning entry, four trophies get purchased at $260 or more each). Add the cost of banquet tickets, another hundred bucks a pop. Add spouses and other guests. If your station is WSB, a station that — I’ll stick my neck out here — is rolling in dough, a few tens of thousands of dollars for Emmys is chump change. But if your station is fighting to survive in the changing world of TV news, you ask yourself the question WAGA has asked: Should I devote tens of thousands of dollars for awards? Or do I use that money for a salary or new equipment or repairs on existing gear– the stuff that actually helps a station gather news? Awards serve several purposes: They make the recipients feel good about themselves. They send a message that their employers value the extraordinary work they do. And they give the station something to brag about, promotion-wise. If you’re trying to draw viewers to your station, you want to have tangible evidence that your station is actually worth watching. Awards can help do that. If you draw more viewers to your station, your ratings go up. You get more advertising money. Then you can hire another assignment editor or photographer. At least, that’s the theory. But they’re not buying it at WAGA. To its credit, WAGA has resisted the temptation to thin its I-team, or to make reporters shoot their own stories. Those things cost money — money they aren’t spending on Emmys. Funny thing, though. Plenty of folks filled the void left by WAGA. Among many noteworthy awards (here’s the list), category 43 “news excellence” resulted in a tie between WXIA and Noticias 34 Atlanta, the Spanish-speaking Univision station. Both stations somehow beat the aforementioned rolling-in-dough station. I’m guessing the folks at Noticias 34 Atlanta considered the expense a worthwhile one. Congratulations to everybody who won Emmys in 2012, including Monica Pearson! Justin Gray! Chris Clark! Aaron Diamant! John Kirtley! Russ Bowen! Michael Codgill! Tom Corvin!?! And pretty much every single one of my coworkers at WXIA! This entry was posted in WAGA, WGCL, WSB, WXIA on June 18, 2012 by live apt fire. The links at the top and bottom of the piece referencing the “lists” are returning a 404 Page or File not found error. The one in the middle appears to be okay. Sorry ’bout that. As for Fox 5 resisting any temptation to even consider thinning the I-Team, I would suggest that’s a very wise move on management’s part. The Poo-Bahs would be cutting themselves off at the knees. It’s definitely one of the station’s strongest, most credible assets. The I-Team’s ongoing “awards” are its viewers’ enduring appreciation. Thanks for pointing out the issue with the links. I’ve changed them. You’ll go to the NATA page, then you’ll have to click their “view 2012 emmy honorees” link. So here’s a question. Why is the WAGA I-Team regarded so highly, while the WGNX Tough Questions team is considered laughable? What’s the difference in the two products? That’s easy! WGCL overplays its “tough questions” brand, making it somewhat of a civic punchline. Unfortunately, that diminishes the fine work its investigative folks regularly put on TV. “Tough questions” is a legit place for TV reporters to go, every day. But beating the audience over the head with it promotion-wise makes it, as you say, laughable. WGCL (and it IS WGCL, CBS Atlanta 46) does really fine investigative work..given its resources which are probably far, far fewer than the I-Team’s. The I-Team also has been “fine-tuning” its franchise in the market far, far longer with a tight knit group of dedicated men and women who’ve worked together many years. That counts for a lot. The Tough Questions guys should stay scrappy, and continue to ask even tougher questions. Because they’re young and hungry they’ll eventually hit on a great story no one else has. Then they’ll begin to get the respect they deserve. Just a matter of time and opportunity. It’s not rocket science, just persistent hard work. First off, no. I did not scribe the above post. But as a member of CBS Atlanta’s investigative unit, I was one of three in our unit to be presented with an Emmy this year, so thank you for your feedback! We’re working hard everyday to bring you the best product in the market. Second, hats off to Fox 5’s Mike McClain for ‘absorbing’ some of cost for his team- Job well done by all @WAGA. Understanding the tide of the post, I think we’d be remissed not to point out WXIA’s investment: 120+ entries x (an average) of $90+/per(x 2+ per category)= “Tens of Thousands of Dollars”. I think I’d choose better teevee equipment too, sir. At the end of the day, congratulations to all- it is what it is. It is my understanding that WAGA will soon start charging employees for toilet paper (remember when the airport stalls had coin slots), pens/pencils, and even air conditioning. Little timers on the thermostats like parking meters. 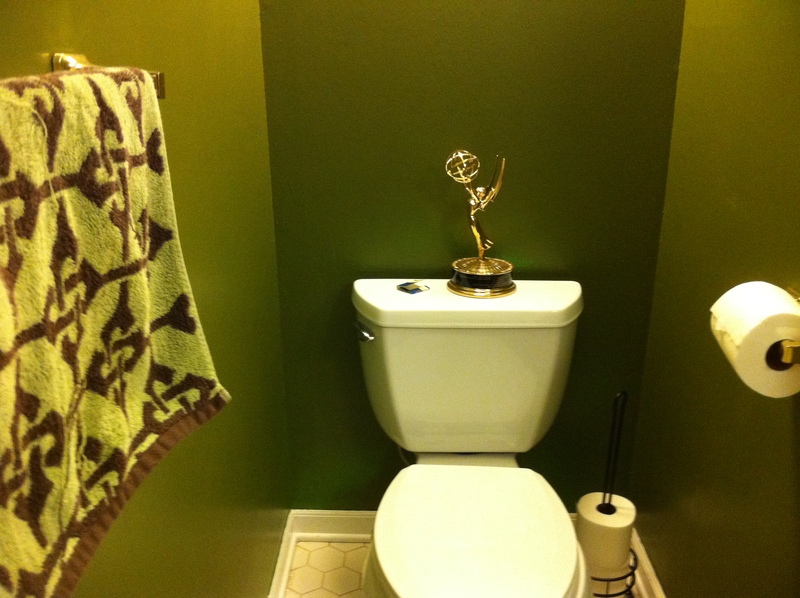 How much did the Low Flow Emmy cost?